LIFEPLUS™ TC3-W – Mountain Power, Inc.
Patented LIFEPLUS TC3-W chargers are the product of more than 25 years of high-frequency charging experience. Only HAWKER has the extensive, proven track record of substantially reducing charging costs and the cost of operation with high-frequency, IONIC smart chargers. Cost Savings – LIFEPLUS TC3-W technology offers the highest conversion efficiency and highest power factor available in the industry – significantly reducing electrical consumption and demand charges. The TC3-W operates at efficiencies of 92% and a power factor of .96. Plug ‘n Play Flexibility – The TC3-W responds dynamically to charge a wide range of battery voltages and capacities without user intervention. LIFEPLUS is the easiest high-frequency charger in the industry to operate. On-site programming capabilities allow the charger to be custom tailored to the application’s specific needs. Advanced Data Management – The TC3-W with the Ethernet option can be accessed remotely via a local network. The TC3-W communicates wirelessly to the Battery Boss WC (BBWC) unit and maintains a data history of 17 different charge parameters from the last 200 operating cycles for easy analysis and optimization. Opportunity Charging – The LIFEPLUS TC3-W offers three user-friendly ways to employ opportunity charging – or charging during idle periods – to extend battery run times. Extended Battery Warranty – LIFEPLUS TC3-W delivers an optimal charge with less heat gain. POWERLINE™ and ENERGY-PLUS™ batteries charged on LIFEPLUS TC3-W chargers (in the IONIC charge mode) extend battery life and increase the warranty to 6-years or 1,800 cycles – saving up to an additional 20% life on your battery investment. 1. IONIC – This patented HAWKER exclusive is the preferred choice for most applications. Employing periodic current pulses which both identify the battery’s true capacity and state of charge and mix the electrolyte throughout charge to avoid acid stratification, this profile provides the optimal recharge with minimal heating. 2. COLD STORAGE – The LIFEPLUS TC3-W charger series allows the configuration of the charger for use with batteries in cold storage applications. The profile is an I-E-I charge type (constant current, constant voltage, constant current) with a number of user-configurable parameters. 3. 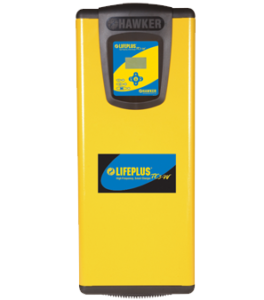 ENVIROLINK™ – The LIFEPLUS TC3-W charger comes standard with a profile specifically for the HAWKER ENVIROLINK™ valve-regulated batteries, as well as the industry-standard gel batteries. 4. TPPL – This charge profile uses a 50% start rate, allowing for fast or opportunity charging of Thin Plate Pure Lead batteries. The LIFEPLUS TC3-W charger has a built-in equalize charge that keeps the battery at the optimum state of charge throughout the day. Battery Boss WC Control – The BBWC enhances the TC3-W’s already elite charging capabilities by collecting vital battery information, which is then processed by the TC3-W to help optimize battery throughput and life expectancy. This data can also be retrieved and analyzed by the user to better manage fleet operations. The BBWC is a compact, wireless electronic device that attaches to the battery and provides real-time data wirelessly to the charger. Control Panel – The battery’s size may be programmed through the charger’s control panel. Please note: this has the disadvantage of making only that battery size suitable for the charger in opportunity mode. Whether using the Battery Boss WC or the Control Panel, the charger will only charge up to 80% state of charge during the day and then complete an IONIC finish charge daily, as programmed in the profile set-up. Power Factor - Probably the most important factor in saving you money is power factor. Power factor is, in effect, the percentage of the power being supplied by the utility (“Apparent Power”) that can actually be used by your charger (“Active Power”). POWERTECH™ operates with a power factor of .96. High-Frequency – The POWERTECH™ charger takes incoming AC, rectifies it, and then inverts it into high frequency AC. This isolation of the charger components from the AC line allows for power factors at or near unity. LIFEPLUS TC3-W chargers are the smartest and most energy-efficient chargers in the business. The TC3-W charger series reduces your battery recharge costs, reduces water consumption, and reduces battery maintenance and repair costs. Energy Savings – LIFEPLUS TC3-W’s precise profile charge, its IONIC profile and lower charge factor, and its unmatched electrical efficiency means that you can save on your electrical costs. Maintenance Savings – With the LIFEPLUScharger IONIC technology and lower charge factor, you will spend at least 25% less time and less money watering your batteries, when charging in IONIC mode. 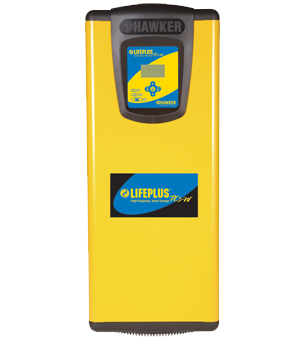 Battery Savings – LIFEPLUS TC3-W chargers can extend the life of your battery fleet by a minimum of 20%. Less heat generation during recharge means longer battery life, less downtime, and less money spent on battery repairs and replacements. Obsolescence Savings – LIFEPLUS TC3-W’s plug ‘n play flexibility means that your chargers may not need to be replaced when your present trucks or batteries are replaced. LIFEPLUS TC3-W covers three voltage ranges and a wide range of ampere-hour capacities in one unit – automatically. Built-in USB port to conveniently download charger data and/or upload firmware to modify the charging capabilities from a USB drive. Auto cell sizing allows the TC3-W to charge batteries of multiple capacity ranges. Built-in, real-time clock automatically adjusts for daylight savings time. Auto Equalize feature allows for equalization on multiple days of the week. Built-in arc-less circuit reduces arcing during accidental disconnection of connectors.